This is some pretty incriminating evidence right here. 44-year-old Rusty Moore of Gulfport, Florida was drunk last week and saw two cop cars parked in his neighborhood. 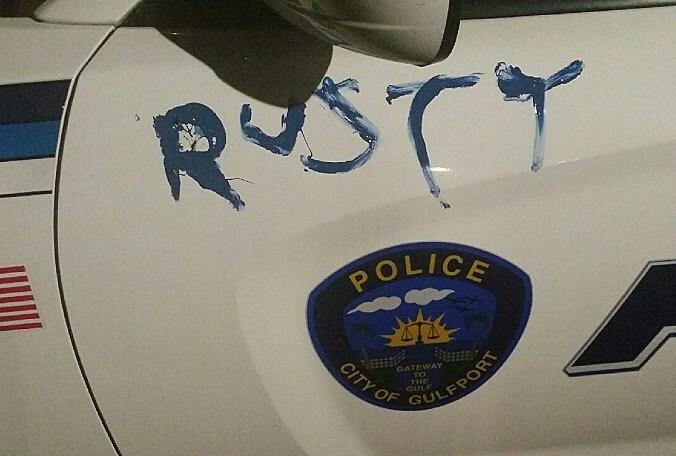 So he decided to grab his paintbrush and paint his name on the cars: "Rusty" on one and an "R" on the other. We're not sure why he stopped at "R," maybe he ran out of paint? Then he went home. The cops easily found him, they did have his name, after all, and when they went to his house to question him, he threw a bucket of blue paint on them. He's not particularly repentant over what he did. He told a news reporter, "I was a little inebriated and full of stuff and vinegar, and happened to be painting, so I walked out there, sat on the curb, and painted my name."